Mike didn’t even raise an eyebrow when I told him that I’ve made hoop dancing part of my rehabilitation, bless him. I was thrilled – not only am I doing a pretty serious workout, I’m moving muscles I didn’t even know I had (rhythmically and with joy!) And posture mindfulness, well that plays an enormous part. It’s a real turnaround for me, who was not doing any physical workout this last year or more. It is huge fun and I’m feeling an enormous benefit in a really short time. 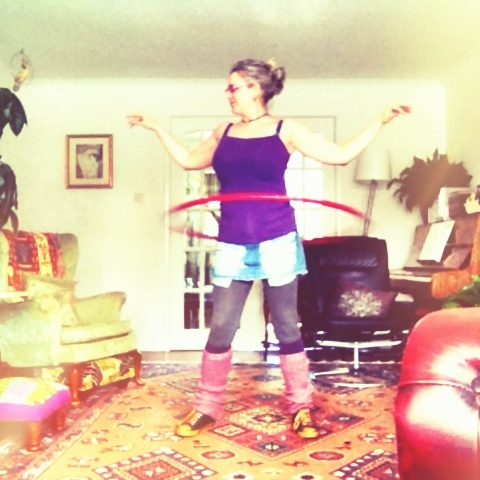 Always thinking about the bigger picture, I have also been exploring my thoughts about hooping as a form of active imagination, a la CG Jung – and the hoop dance as a physical expression of the mandala archetype. This has all come about as part of my journey on the Great Round of Mandala, which I’m leading this year with twenty other gorgeous women. I’m constantly amazed about the revelations I’m uncovering as a result of this work. It’s a journey into our unconscious, our inner worlds and dreamscapes. That it has so much impact on our daily, conscious lives continues to amaze me. Not only will you get fitter and have loads of fun, you’ll be honouring the call of the sacred circle – a feminine way towards wholeness. Sounds delicious, hey? Julie you just might have come up with the answer I was waiting for.